STURGIS - Equestrians from nine states and Canada are slated to compete in the Ft. Meade Remount, beginning today at Fort Meade. This is an endurance ride in which horse-rider teams are timed on 25- and 50-mile courses. Ride manager Kerry Greear said she sanctioned those rides both days, and a 15-mile fun ride is planned for today. Greear said riders from Missouri, Maryland, Kansas, Vermont, Colorado, North Dakota, South Dakota, Montana and Wyoming will represent the United States. Plans are for the riders to use the Centennial Trail. Riders will see historic buildings, use a tunnel to go under South Dakota Highway 34, see the Bear Butte Horse Camp and enter United States Forest Service and BLM land. Interested individuals may come to the Alkali Creek Horse Camp area to see the horses and chat with the riders. The camp is north of Interstate 90 off Exit 34 on the other side of the chapel building. Greear said the 50-mile ride will begin at 6 a.m. today, and trotting will start by 7:30 a.m. The rides start and end at the camp. Riders are sanctioned through the American Endurance Riders Conference. While the event is timed, Greear said, the conference’s motto is "To finish is to win." She said the horse must be judged fit to continue. Liz Boo from Belle Fourche, Leon Self from Oklahoma and Irina Weese from Wyoming will be on site all weekend as control veterinarians. Horses participating in the 15-mile ride will undergo the same veterinarian checks as the limited distance (25 miles) and endurance (50 miles) events. This is the third year for the event. Ninety riders from seven states participated last year, and Greear said the Hills have never hosted an event like this. On July 2, Carla Stroh went to Wheatland to a historic ranch to enter an Endurance Race the next day. It was her second Endurance Race after winning first place in a 30 mile ride the year before. Stroh rode the 2009 challenging ride of 55 miles on a horse that she affectionately calls "Spook". She recruited a visiting friend, Barb Orr from Mesa, Ariz., to be her "crew", a responsibility that involves helping out with the stops that are a part of the race. Every rider had their horse checked by the vet, Max Smiley, before entering and then again at regular intervals for conditions, including hydration, capillary refill, pulse and respiration. Riders carry a card with them to be filled out at each check. If any horse shows signs of stress, it gets pulled from the race. The race began at 6 a.m. and Stroh and her crew member Orr rose at 4 a.m. to be sure they had time to feed Spook and be sure he was ready to ride without being rushed. There were 44 starters at the beginning of the ride, with six riders starting out at a gallop up a steep and rocky hill. Stroh stated "I kept Spook with the second bunch of riders that took a more leisurely pace as I knew there were miles to go yet and the idea is to get your horse to the finish line...". That's the distance covered by a group 48 riders on horseback to make it from El Paso, Texas, to the home of Trell and Maggie Elliott 12 miles west of Hemingford. Trail master Tom Seay said some of the riders stayed with the Elliotts during their brief visit to Box Butte County in the Panhandle recently. Others headed on to the next campsite a few miles up the road. Trell noted that the riders have just been great, jokingly adding that he also gets his grass cut and free manure during their stay. The riders would join up again the next morning to continue their journey _ a total of more than 2,000 miles when they reach their Canadian destination of Estevan, Saskatchewan. Seay, who is from Virginia, said the journey began April 21 near El Paso, and is expected to end on Sept. 5. The ride is being recorded for "Best of America by Horseback," a television program on the RFD-TV channel. On the journey up, the riders passed through New Mexico and Colorado, and after leaving Nebraska they will go through South Dakota, North Dakota and briefly into Montana before crossing the border into Canada. 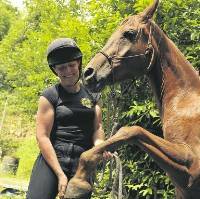 Hopkins County, KY - Local resident competes in endurance riding. To have a horse in your life is truly a gift. It is a lifelong passion that began for me as a child. Now well into middle age I continue my obsession as I compete as an Endurance rider. My background in riding has always been in Cross Country jumping and Dressage. Nothing has captivated my spirit like teaming up with my horse to cover 25-50 miles of trail at a time. Endurance riding is an equestrian competition where horse and rider as a team ride cross country on marked trails for 25-50-100 miles. You and your horse must be fit as you are evaluated at the start, middle and end of your ride by a veterinarian. To keep my horse’s fitness level where it needs to be ,I take advantage of Western Kentucky’s many trails. I train during the week either at Pennyrile State Park, or Land Between the Lakes. My competition horse Guinness and I log around 15-30 miles a week. Most Endurance horses are Arabian; however my little guy is a Pinto. I have seen walking horses, Quarter horses and even ponies at rides. I don’t receive ribbons or trophies, but the satisfaction of completion. Rides are sanctioned by AERC(American Endurance Ride Conference) and there are rules to follow. All mileage and points are recorded by AERC.The motto of any Endurance rider is “To finish is to win”. Many of North America’s best equestrians got their start at the NAJYRC including Olympic medalists Greg Best, Karen O'Connor, Chris Kappler and McLain Ward. Opening ceremonies begin at 6 p.m. on Wednesday, July 22, and admission is free of charge (there is a nominal parking fee for the Kentucky Horse Park). For more information, visit www. http://www.youngriders.org/. The American Equestrian Trade Association (AETA) and Equestrian Land Conservation Resource (ELCR) have formed a partnership that will benefit both riders and the equestrian trade. The Associations - AETA is a non-profit trade association and ELCR is a non-profit educational organization - have agreed to share informational resources and work together to encourage and nurture interest in equestrian activities in the United States. AETA's members, many who are avid riders and landowners, actively support ELCR's mission of advancing the conservation of land for horse-related activity. AETA, as an Association, recognizes that without riders and land for equestrian activities, there is no equestrian trade. Since its establishment in 1997, ELCR has assisted equestrian sport, recreation and industry in advancing responsible land stewardship and conservation for horse-related activity. The organization educates and facilitates partnerships to preserve access to trails on public and private lands. It provides information on best farm management practices to protect soil and water quality. It provides guidance to both large and small landowners in the protection of open space through conservation easements, the purchase of development rights' programs (PDR's) and community land use and comprehensive planning. For more information on ELCR, please call us at 859/455-8383, email info@elcr.org or visit their website at www.elcr.org. Devon without shoes on his hooves. A KEEN Flintshire horserider is to take on a major endurance challenge. Sarah Braithwaite, of Nercwys, is travelling 260 miles from North Wales to North Devon to highlight the level of performance that can be achieved from barefoot horses. She will be riding on six-year-old Chestnut Arab horse, Morris. Sarah is experienced in the field of endurance rides, and said she is extremely excited about the challenge. She said: "We started talking about a possible trip at Christmas after coming across many riders who didn't fully appreciate what barefoot horses can do. "I've always wanted to ride the Long Mynd in Shropshire, and we've intentionally drawn up the map so we can ride along it on this journey." Ottawa, Ontario—Endurance Canada and Equine Canada are pleased to announce that the selection criteria for the 2009 Endurance Kentucky Cup CEI3* event has now been posted on the Equine Canada website. Riders who are interested in representing Canada at the 2009 Kentucky Cup must achieve all the required selection criteria during the qualifying period of January 1, 2004 through August 1, 2009. Riders who would like to be considered for selection must declare their interest to Equine Canada by August 6, 2009, in accordance with the selection criteria. The 2009 Endurance Kentucky Cup CEI3* will be held October 14, 2009, at the Kentucky Horse Park, in Lexington, KY, USA. This top international venue has been completely redesigned to host the 2010 Alltech FEI World Equestrian Games. For additional information on the CRC and its programs, please visit the Endurance section of the Equine Canada website or e-mail endurance@equinecanada.ca. 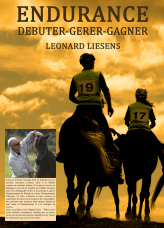 The community of endurance riding had no recent and comprehensive book written by a top level competitor. 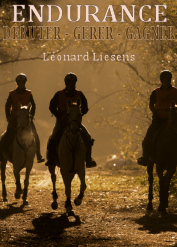 The vacuum is now filled with the book "Endurance - Start, manage, win" by Leonard Liesen. The foreword is by Jack Bégaud. With the participation of Dr. Jean-Marc Lamolle for veterinary checks. With photos of Carroll Gatelier. Pierre Arnould: "warning, understandable and sometimes poetic." It says "The vision is not completely monolithic, but pluralistic and is a leader of ideas and tracks." Begaud Jack writes in his preface: "Thank you for this bold initiative led to a precise panorama, well researched, balanced between reason and feeling, which reads in one." Vincent Dupont: "Clear, precise and full of lessons for beginners and for others." The sisters Houassin: "This is a book that is clear and not running around the bush". Christian Depuille: "I do that at the half but I have reviewed my training and my approach to discipline." Anne-Gaelle Goachet: "The foundations of the discipline are finally put on paper. And for researchers like me, your book is a reference solid," Liesen, 2009 "probably appear in my next scientific!" The book is available in France, Belgium and elsewhere. For the first time ever, the Arabian Horse Association (AHA) will combine the National Endurance Ride and National Competitive Trail Ride into one week of exciting competition, which will include American Endurance Ride Conference (AERC)-sanctioned rides, October 27-31, at Lake Carl Blackwell in Stillwater, OK.
Competition begins Tuesday, October 27, with the AHA National Championship 100-Mile Endurance Ride, coupled with three coinciding AERC endurance rides— a 100-mile, a 50-mile and a 25-mile ride. The AHA National Championship competitive trail ride (CTR) spans two days, October 28-29. The last days of national competition will feature the AHA National 50-Mile Endurance Ride, along with a 50-mile and 25-mile AERC-sanctioned ride on October 30. The Ozark Country Endurance Riders (OCER) will host a Halloween special, Witch Way Ride, on October 31, as well. The dates of the National Distance Championships coincide with that of the U.S. Nationals in Tulsa, OK, about an hour and half away, giving horse lovers in Oklahoma plenty to watch in October. Arabians, Half-Arabians and Anglo-Arabians, known for their versatility and athleticism will be on display at the National Distance Championships and U.S. Nationals for the public to enjoy everything from the grueling 100-mile endurance ride to the glitz and glamour of English pleasure and the excitement of working cow classes. For more information visit www.ArabianHorses.org/competitions or call (303) 696-4500.